US coal giants have been hit hard, unable to compete with natural gas at home, but overseas this market is getting hotter by the minute. 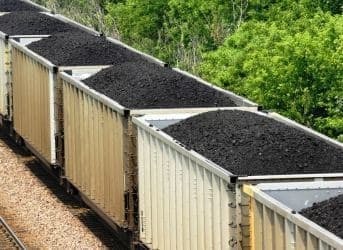 Illinois is a key coal state benefitting from this development, with the latest reports showing that it exported a record 13 million tons of coal last year. This is a major increase over the previous years, with only 5.5 million tons of exports in 2011 and 2.5 million tons in 2010. So now production is back on the rise. Illinois’ production is up 25% over 2011, and counting—despite that fact that US coal production in general has been down about 11%. US coal-producing states are ready to take advantage of global markets that are starving for this cheap coal. Illinois also has another advantage: It’s close to key shipping routes (the Ohio and Mississippi rivers—which are the pipeline for coal heading to the Gulf of Mexico and on to international markets. Wyoming is the biggest coal producer, home to the prolific Powder River Basin. Some 40% of all coal produced in the US comes from Wyoming and Montana, the two states this basin straddles. Montana is also seeking to boost its coal production for exports, targeting a double of figures. However, it’s facing environmental protests over plans for a coal export terminal that would give it access to global markets. For now, Montana produces less than 10% of Wyoming’s volumes. Where’s all the coal going? For now, the biggest buy is the Asian market. And it is these markets that could hamper the natural gas blow for coal. The industry is struggling at home thanks to cheap natural gas and environmental legislation, but outside the US, it could indeed find a savior in overseas markets. Demand in Asia is skyrocketing, particularly in China, the largest burner of coal in the world, and Japan, which is reducing its reliance on nuclear power, and India, where the pace of economic growth is too fast to maintain enough coal supplies. So now the race is on to get this cheap US coal to these overseas markets. While Illinois has access to the Gulf of Mexico, for Wyoming and Montana, it largely goes through Canadian ports. Thus, the race is being defined by who can build the domestic infrastructure fastest. Exporters are eyeing four new terminals in Oregon and Washington to this end. If built, these terminals could handle up to 130 million tons of additional capacity a year. Also worth watching is the trading game on this one. Traders are stepping up activities in a rush to match up potential buyers and sellers of cheap US coal. They might start finding potential on the buyers’ side in non-Asian markets, like Europe, where the recent carbon permit backloading scheme was rejected and threatens to make coal even more attractive to burn. Companies have backed out so the only current contenders for Pacific Northwest coal export terminals are Longview and Bellingham.